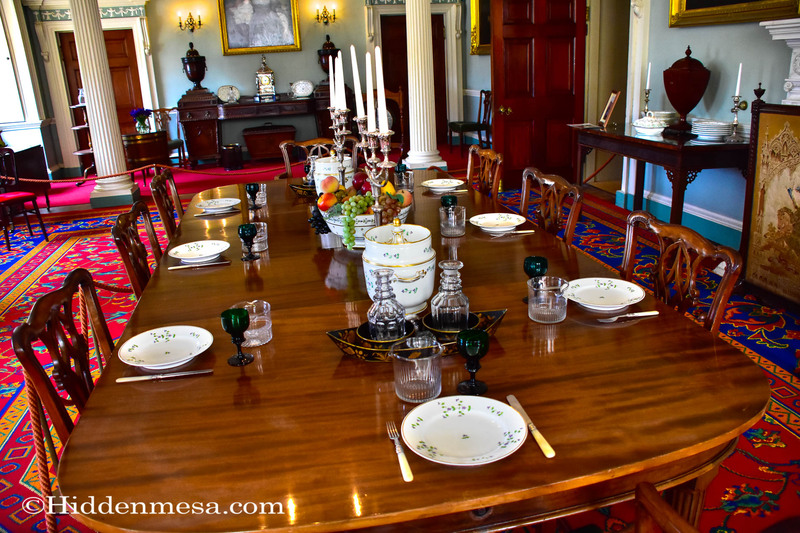 Something we don’t get to enjoy from a ship’s tour are some of the more exclusive things that come with a place like Culzean Castle. There’s a hotel located on the top floor, which are the rooms of General Eisenhower’s apartment. After President Eisenhower’s death, the apartment was converted into the Hotel Eisenhower, a small hotel capable of accommodating up to 20 guests. There is a restaurant that serves an upscale dinner on Friday and Saturday nights, and breakfast is served daily. Prices to stay at the Hotel Eisenhower are surprisingly moderate, considering the exclusive and luxurious nature of the surrounding. Of course, the definition of our use of the term “moderate” may not be the same as another’s idea. For some it might be out of the question and for others, the price might be trivial. Only you can decide if it’s right for you. Reviews of the hotel seem to indicate that most folks regard it as a good value. There’s a deer park on the Culzean Castle grounds. 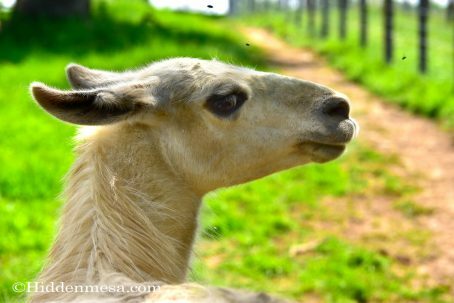 There are several deer and llamas as well as other animals. This is, of course, one of the Llamas on the castle grounds, and the annoying little insects flying around. Photo by Bonnie Fink. Across the main parking lot from Culzean Castle there’s a large fenced area where you can view several different species of animals. There were various deer herds, llamas, a few goats, and so on. 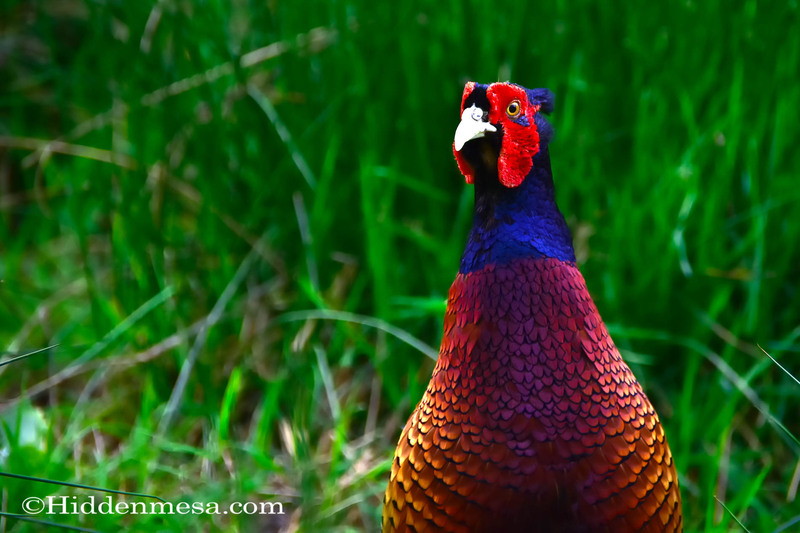 But one of the most interesting animals we found was the pheasant we found walking in the grass among all the ungulates. The bird was certainly a wild animal since he was clearly capable of flight, but probably learned to hang with the Deer Park animals, mainly for the food. The purpose of the Deer Park at one time might have been to demonstrate some of the animals that might have been hunted on the property back in the last part of the 18th century, when the Castle was new. That is, of course, until the Llamas showed up. And there might actually be a purpose for the Llamas that we’re missing, so we can leave it at that. The Deer Park wouldn’t be a reason to come to Culzean Castle in and of itself, but it was fun to watch the animals as they went about their business, mostly ignoring the tourists. Culzean Castle is on the coast of Scotland overlooking the Firth of Clyde, which is a body of water between Scotland and Northern Ireland. It’s about 50 miles southwest of Glasgow, and 430 miles north of London. The two ways that make sense to us for visiting is either from a British Isles Cruise like we did aboard the Caribbean Princess, or from a plain ol’ road trip. We flew into London and rented a car a couple of years ago and drove up into northern Scotland for a little over a week. We had a great time visiting the sights. Culzean Castle could have easily been on the list had we known about it at the time. Actually, we would have strongly considered spending the night, had we known about it at the time. 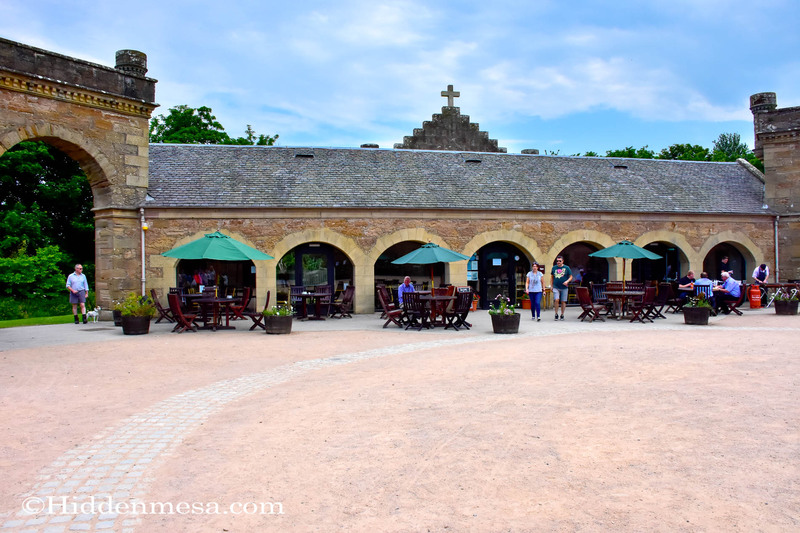 Another way to visit Culzean Castle is to consider a train to Glasgow, then use a tour company from town to get out into the countryside. We’ve found these advertised at modest prices. 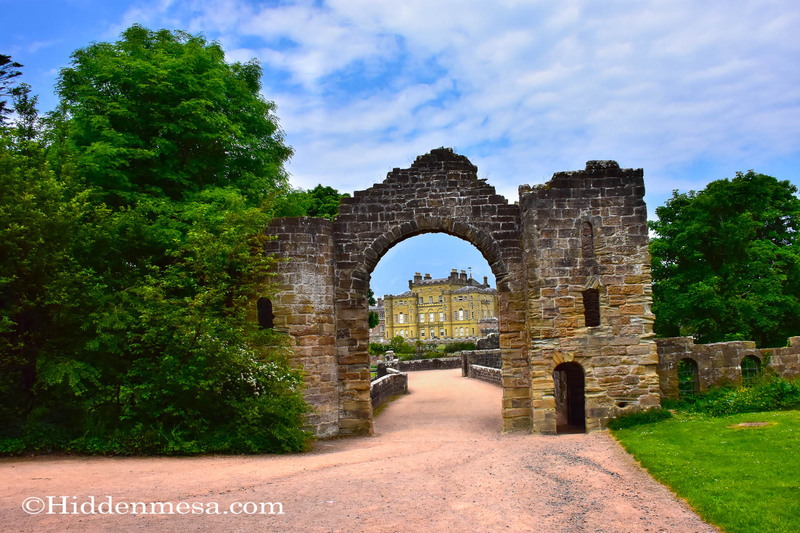 We’ll no doubt make another road trip into northern Scotland at some point in the future, and Culzean Castle will be on the list. We would like to spend more time there, perhaps staying the night and walking the beaches below the Castle along the cliffs. Who knows, we might find the ghost of the piper. The Farm Restaurant, located near the main buildings, is a small cafe with quick service foods and drinks. There was indoor and outdoor seating. Photo by Bonnie Fink. 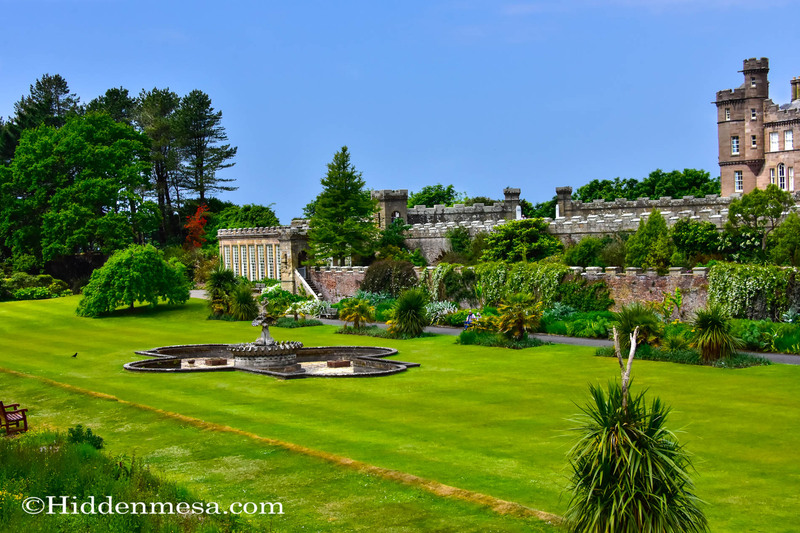 The gardens in front of Culzean Castle. Photo by Bonnie Fink. 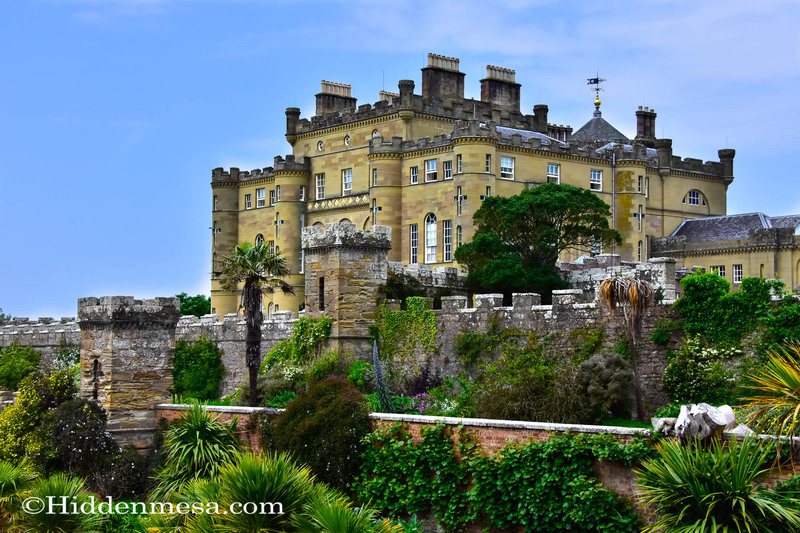 Exterior of the Culzean Castle in Scotland. Photo by Donald Fink. 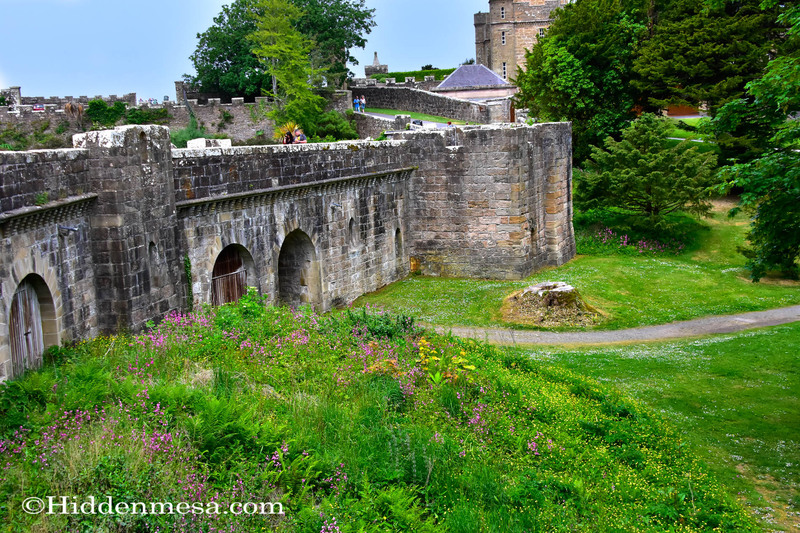 View of Cuzean Castle in Scotland and the gardens. Photo by donald Fink. Old wall and entrance gate frames Culzean Castle. Photo by Bonnie Fink. 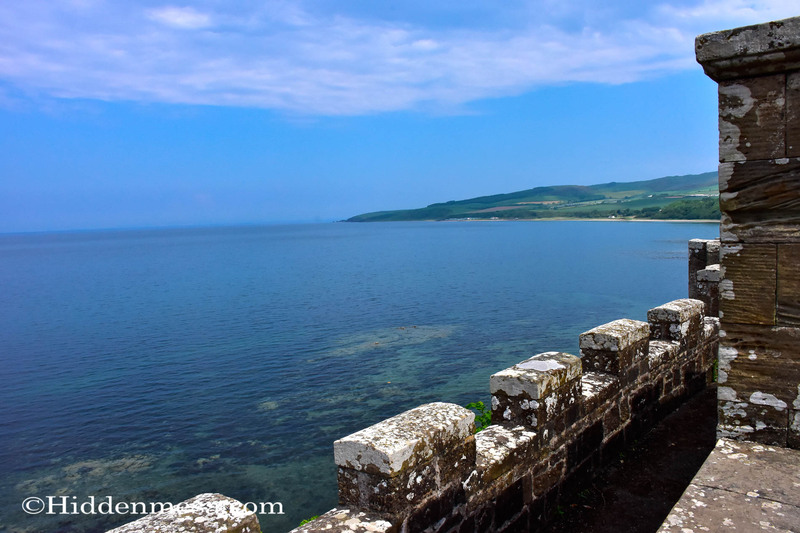 Built in the late 18th Century, Culzean Castle still needed outer defences. Photo by Bonnie Fink. 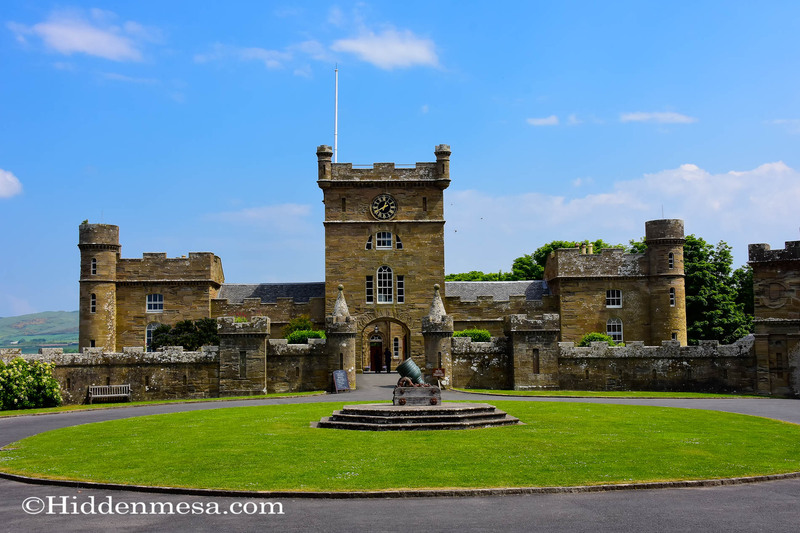 Culzean Castle, with its dozens of fireplace chimneys, turrets, and security walls shows how grand life must have been if you were royalty in the 1790s. Photo by Bonnie Fink. Not all of the animals in the deer park are captive. this resident pheasant seemed to be quite used to people walking nearby, but also looked to be very capable of flight. Photo by Bonnie Fink. Downstairs and off to the side of the castle is the kitchen. this is of course a mock-up of the original, and it's probably a good rendition of the original. 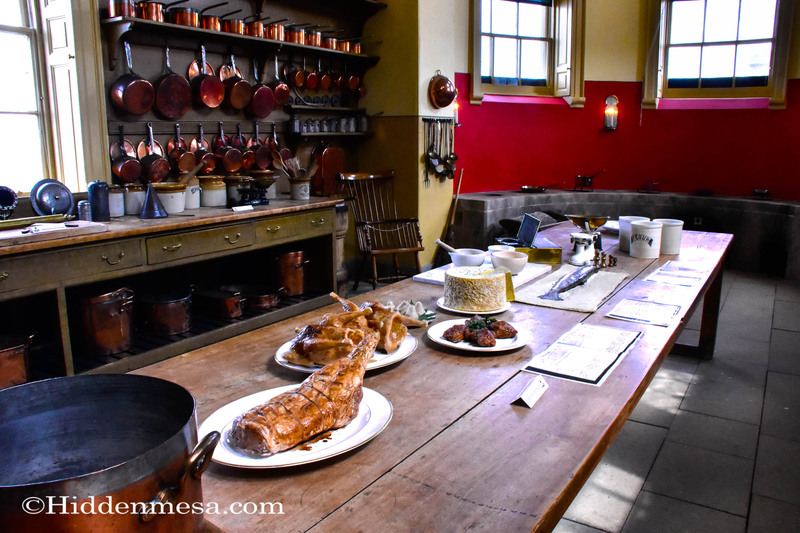 This is as close as we could get, so we were unable to examine the cooking stations along the far wall. And to be clear, this is not the kitchen that's used to prepare the gourmet meals for guests at the Eisenhower Hotel. Photo by Bonnie Fink. There's a deer park on the Culzean Castle grounds. There are several deer and llamas as well as other animals. This is, of course, one of the llamas on the castle grounds, and the annoying little insects flying around. Photo by Bonnie Fink. It's not clear how this bath tub functions. 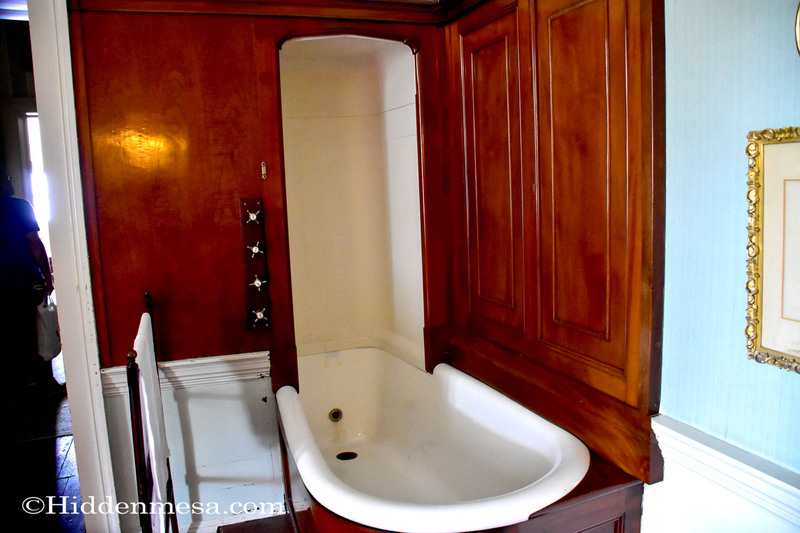 There appears to be an upright section for possibly a shower, but no fixtures. There are also four water valves to the side, possibly for hot and cold water for both the tub and the shower, but again, no fixtures. There's a handy towel rack to the left and an electric button, possibly to summon servants. This is clearly an added improvement from the original house, but it's specific operation is a mystery to us. Photo by Bonnie Fink. This view is looking northwest over the Firth of clyde, the body of water that lies bewteen Scotland and northern Ireland. Ireland is just to the left of this view here. Photo by Bonnie Fink. 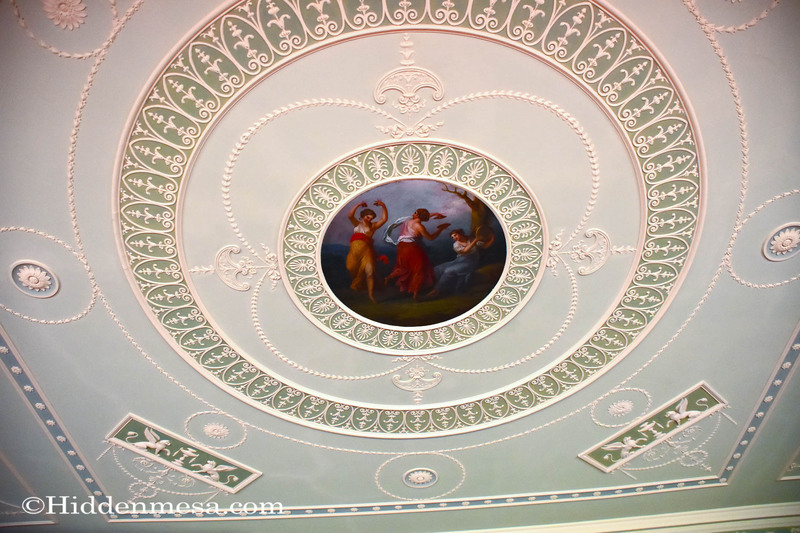 The ceilings are very ornate inside the Culzean Castle. Since all the art we saw appeared to be original, and painted directly on the walls and ceilings, we were a bit surprised that photographs were allowed. Photo by Bonnie Fink. Dining table set for eight in the Dining Room. 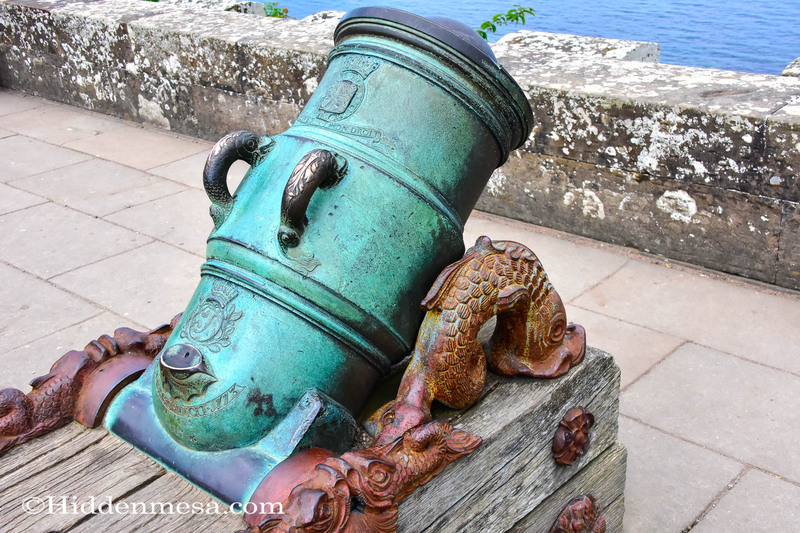 This is in the lower sections of Culzean Castle. 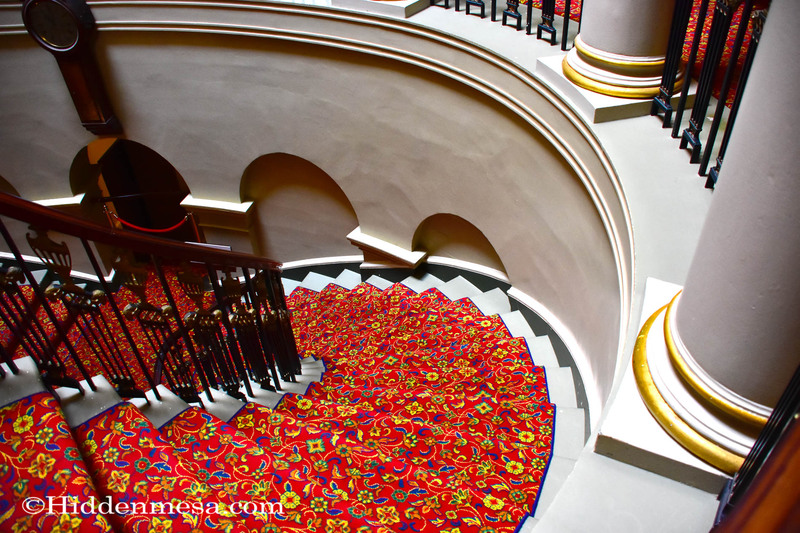 There is a separate dining room upstairs for the guests staying at The Eisenhower, a small, exclusive hotel on the top floors. Photo by Bonnie Fink. Grand Staircase from the second floor down to the main entrance to Culzean Castle. Photo by Bonnie Fink. 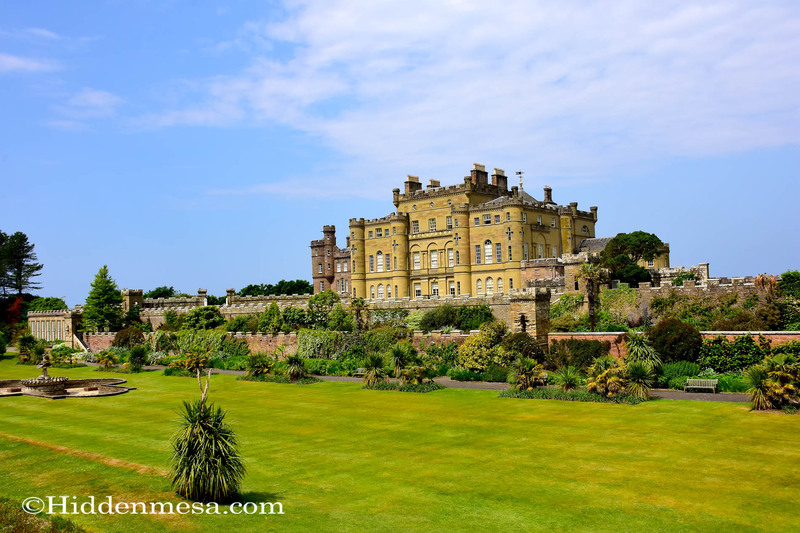 Culzean Castle was a family home. 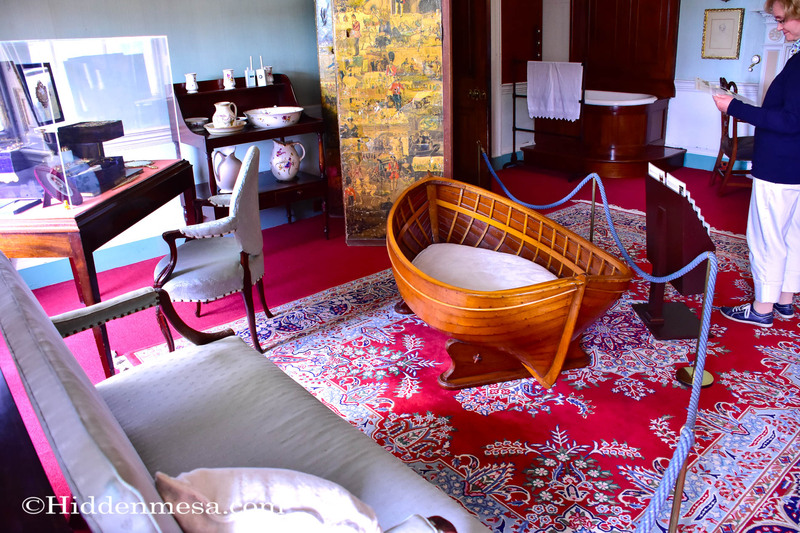 Here, in the Nursery, is a whimsical child's bed fashioned to look like a boat. Photo by Bonnie Fink. Nice pictures. Glasgow used to be on my bucket list as my dad was born there, but now I’m content to stay home.